Whether you are planning to have an intimate wedding or an exorbitant one, Athena Banquet will surely match your unique choice, budget, and requirements. With a capacity of accommodating up to 100 in seating and 600 in floating, the venue has a cosy and comfortable interior for the guests. It also offers an in-house team of caterers that puts all the efforts to delight the guests with mouth watering multi-cuisine dishes. Athena Banquets, Powai, Mumbai is situated in the suburbs of the city. It has a beautifully designed banquet hall with a cozy setting and stunning interiors, perfect for a classy affair. Athena, Powai, comes with an attached terrace with beautiful city views. Athena Banquets, Powai, Mumbai is situated in the suburbs of the city. It has a beautifully designed banquet hall with a cozy setting and stunning interiors, perfect for a classy affair. Athena, Powai, comes with an attached terrace with beautiful city views. 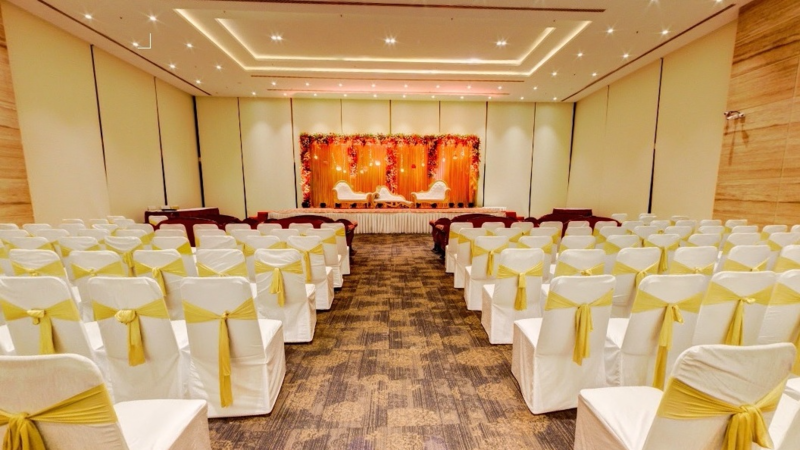 It is spacious and perfect for hosting a grand wedding reception, and all other pre-wedding functions. Enjoy delicious vegetarian and non-vegetarian cuisines while feasting your eyes on the glorious views of the Powai Lake. Athena Banquets, Powai, Mumbai is large enough for a cluster style seating arrangement if you so desire. Offering complimentary changing rooms, Athena, Hiranandani, makes it convenient for the bride or the groom for a quick touch up between the functions.